Ho Ho Ho! Santa won’t need cookies when he sees these decorations! 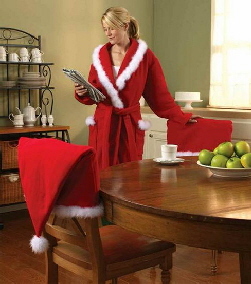 Show your holiday spirit with easy-to-sew chair covers then indulge your Mrs. Claus with a comfy robe. Use any purchased shawl collar pattern and add boa trim.